September | 2012 | YesBiscuit! This week’s Name That Animal comes with a twist but the same solitary rule applies: no researching. Just post your best guess in the comments and I will post the answer there later tonight. 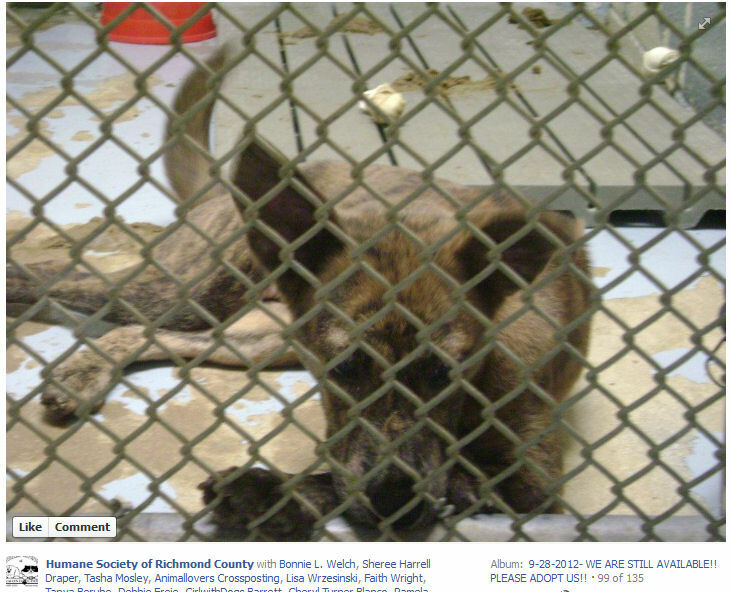 There is currently some online drama surrounding the Humane Society of Richmond Co in NC. The basic issue appears to involve money and has the board threatening to terminate its animal control contract with the county. E-mails and Facebook postings are circulating stating basically that 250 pets at the HSRC have until October 31 to get adopted before the evil county takes over and starts killing animals. 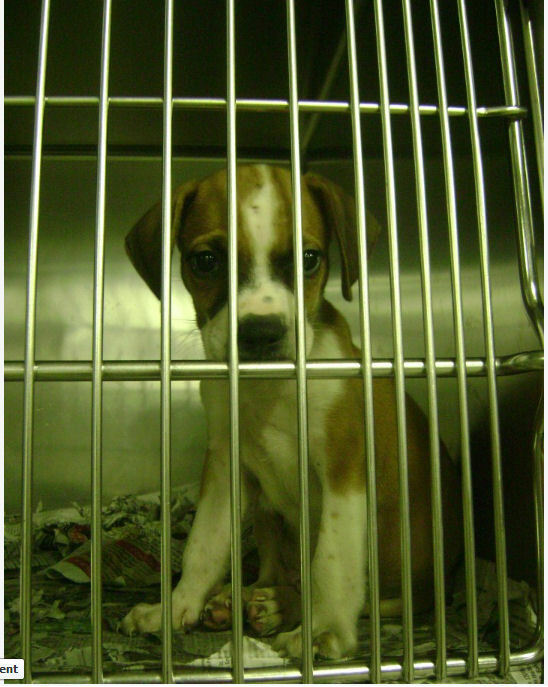 But as Fix NC points out, the HSRC is already killing animals – more than 70% of those who came through the door in 2011. Could the county possibly be worse? Reader Dot contacted me about a number of pets at HSRC posted on FB whom she wanted to help network but was unable to because the photos contain no identifying information. And they depict pets who appear to be suffering in filthy conditions and without veterinary care. Here are some of the unidentified pets posted on the HSRC Facebook page. As heart wrenching as the dog photos are, I found it even harder to look through the cats. Many of them are at the front of the cages, crying or reaching out, apparently starved for attention and desperate to be let out of their cages. 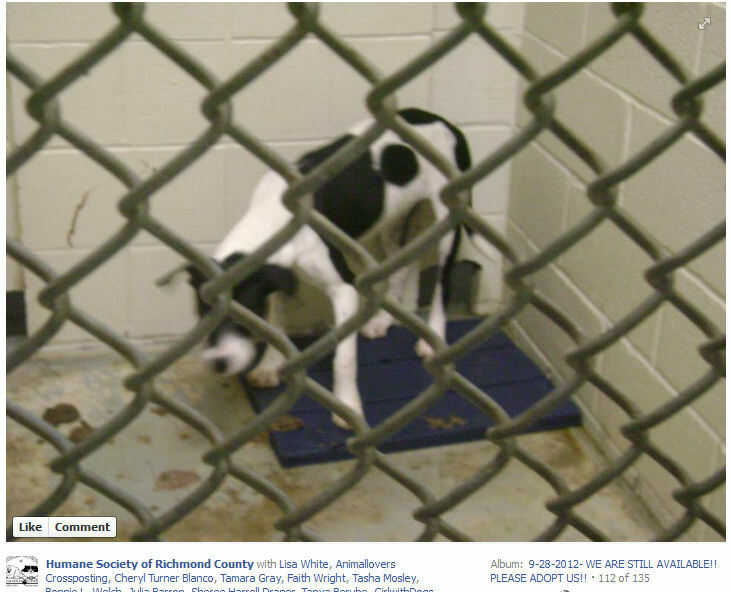 Again I ask, why isn’t HSUS helping the pets at this shelter? 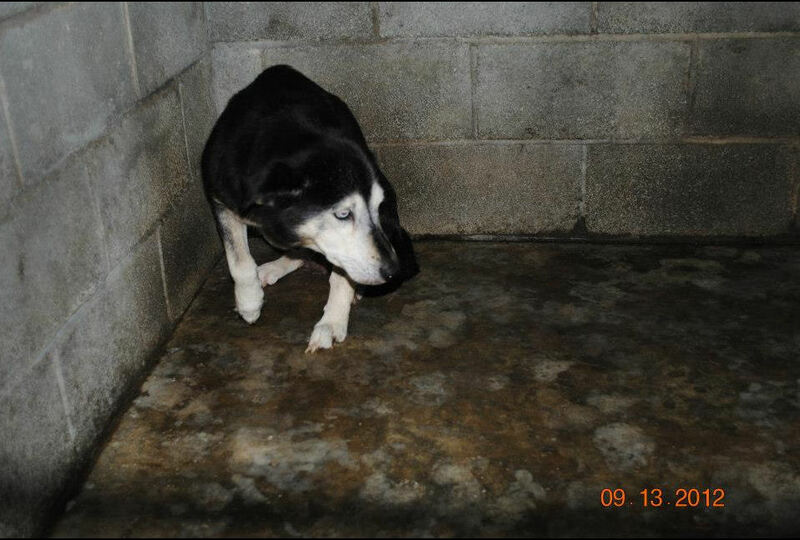 The NC chapter of HSUS is constantly telling us how wonderful the shelters there are and how it’s the so-called irresponsible public that needs to be punished. 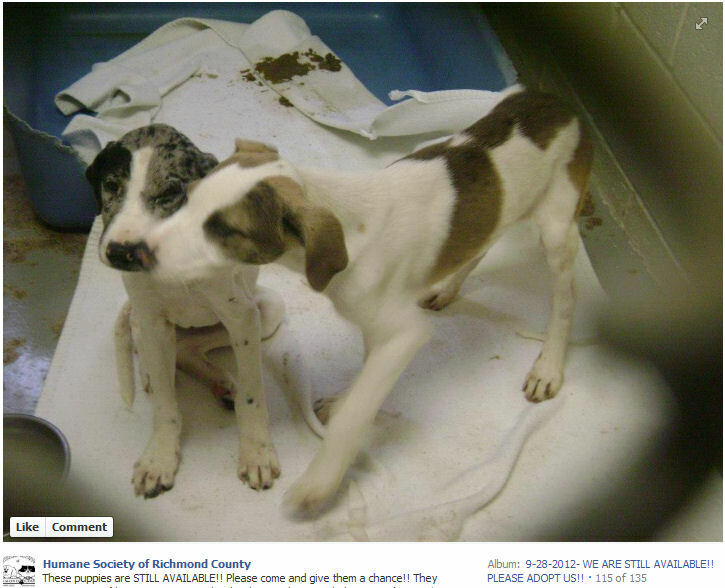 Ask them why they are ignoring the suffering of pets at the Humane Society of Richmond Co. 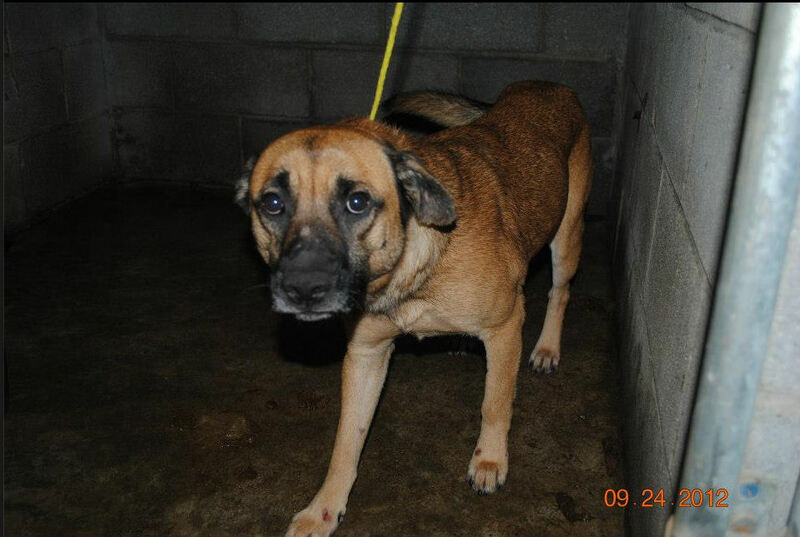 I happened upon a KY shelter dog’s photo on Facebook this morning which caught my eye. So I began flipping through the photo album of the dogs at the Taylor Co pound until I found myself searching the desk drawer for a pencil sharp enough to gouge out my eyes. I am thankful there are volunteers willing to go into the pound, photograph the dogs and post them on Facebook in an effort to help get them out. If not for their volunteer work, these pets would be suffering in relative anonymity and even more dogs would probably be killed at the pound. 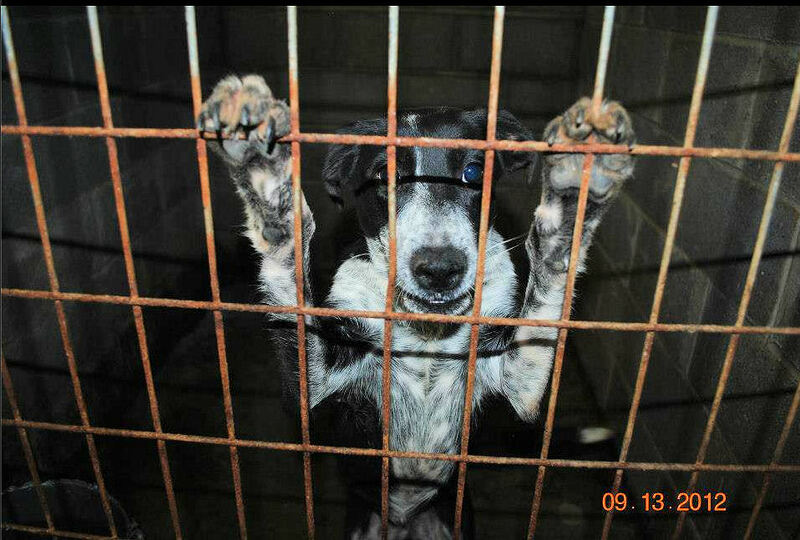 The Taylor Co pound warehouses dogs in what appear to be substandard conditions, selling them for $100. If they don’t sell quickly enough, the pound kills them. If these practices and pictures emerged from a place that was breeding dogs, I imagine HSUS would hop in their “rescue” rig and have the media meet them at the place as soon as the light was good to show off their HSUS logo attire. 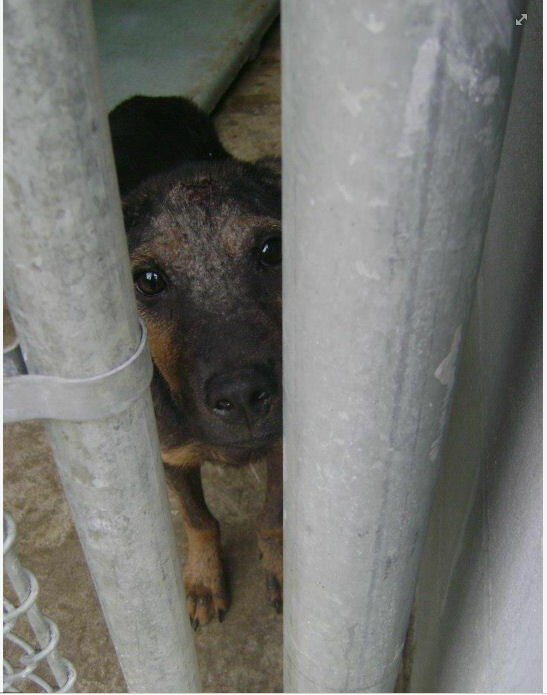 HSUS staff would parade the dogs in front of the cameras, telling reporters how the dogs have been forced to live in terrible conditions, left with untreated medical issues and killed when they failed to generate revenue. Then they would use the case as an example of why new or stronger laws are needed to protect animals from this type of treatment. But given that this is a municipal pound, HSUS will probably give them an award, tell us to bring them cupcakes, or most likely, sit on their $100 million dollar checkbook and do nothing. The notes on this dog say she’s being held in conjunction with a court case. 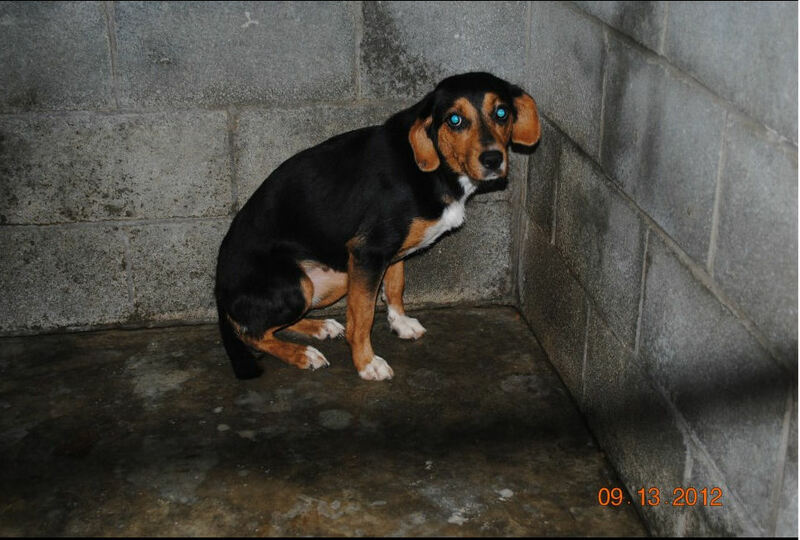 My question: Who is going to bring the court case against the Taylor Co pound for its treatment of this dog and where will she be held then? 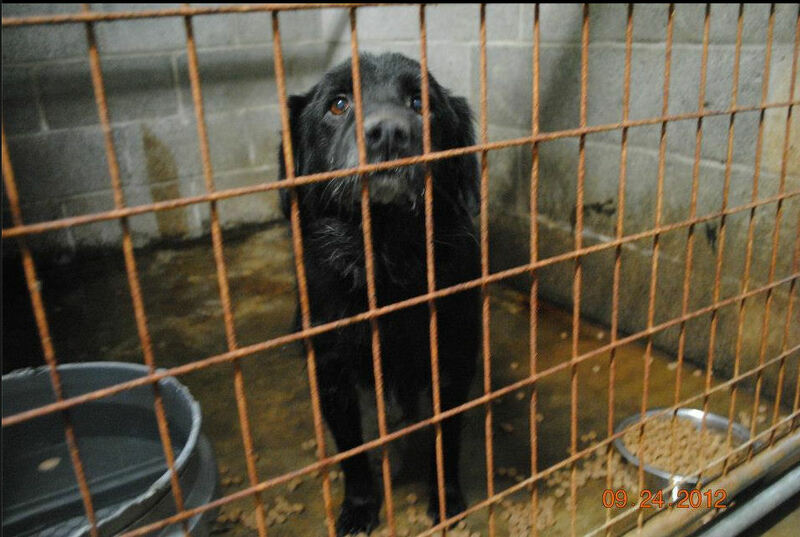 Why isn’t HSUS helping dogs at the Taylor Co pound? An ACO in Shelby Co, KY was attending a required euthanasia workshop where 3 healthy kittens who had been labeled as scared by a pound (not Shelby Co) were slated for killing. 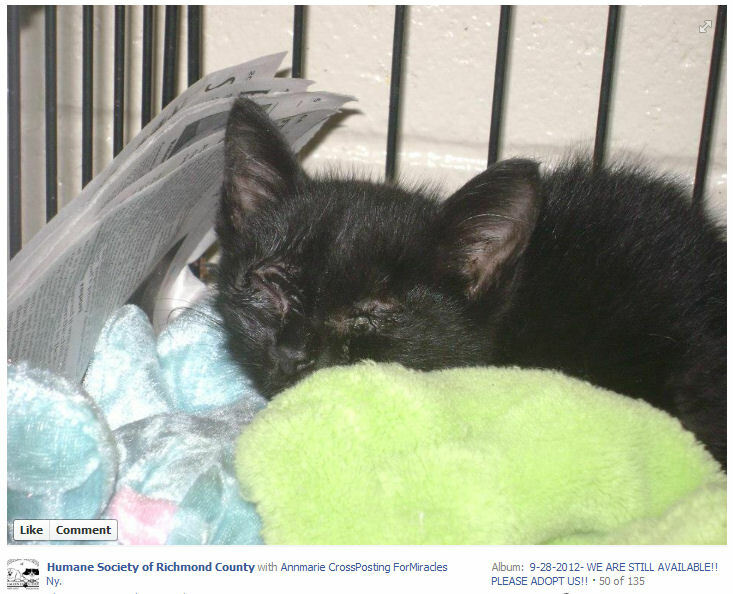 The Shelby Co ACO did not simply go along with this idea and instead brought the kittens back to Shelby Co for care. Thank you Denise for doing what was right. It’s often easier said than done but you got it done. 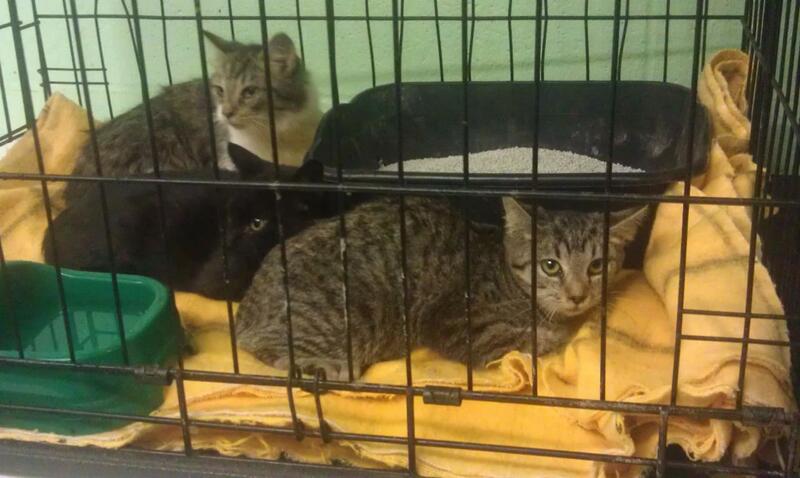 Shelby Co No Kill Mission is seeking homes for these 3 ‘fraidy cats and donations for their vetting. 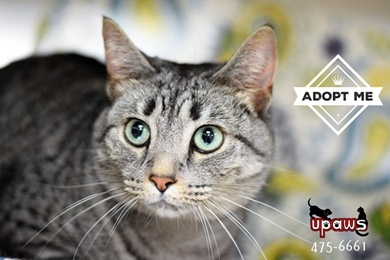 Kelly Jedlicki I updated the status of the fraidy cats on Shelby county no kill mission’s page but wanted to make sure for those who may not have liked us yet are updated. The girls have been named Shirley T (brown tabby), Jennifer W (black) and Anita B (brown & white tabby) after three women who are making a difference in this animal world. With these strong names, these kittens will make a difference as well. They are learning to trust people and are LOVING can food and soft bedding. How do you like that? Tiger cat FTW! Newborn kittens can not regulate their own body temperatures and require a source of warmth. If they are not stimulated to void their body waste, they suffer from both great pain and toxic build-up. And orphans can not eat on their own so must be bottle (or tube) fed every 4 hours. If they are not fed, they become dehydrated and starve. When a shelter takes in orphaned neonatal kittens, there is an immediate need for care. The kittens must be either placed with a nursing mama cat willing to accept them or cared for by a person. If the latter, the kittens must be stimulated in order to void their bladders and they must be warmed. After that, a clean and warm area must be created for them, feedings with kitten milk replacer must be offered every 4 hours and the amounts consumed by each kitten should be recorded after each feeding. Body weights must be recorded daily. If the shelter maintains a foster list for bottle babies and/or a list of local rescue groups, everyone on these lists should be contacted immediately. If no such lists are maintained or if they don’t yield quick results, a plea should be issued to the general public via social media sites, local media outlets and the shelter’s website. It is important to get the kittens into a foster home as soon as possible. If a foster home is not secured before the close of business and no employee is able to take the kittens home overnight, the staff on night duty should be instructed to provide necessary care every 4 hours and document same until the day crew returns. The records mention only 3 kittens being impounded – no mama cat. So presumably these were orphaned kittens. There are no notes in the records to indicate that any care was provided the night of impound to the two kittens pictured nor that they were placed with a nursing mama cat. No weights were recorded in their records and they did not see a vet. There are no notes indicating any pleas were issued to the public for fosters or any rescue groups contacted. The following day was a Saturday. MAS was open. There are no notes in the records to indicate that any care was provided that day. No weights were recorded in their records and they did not see a vet. 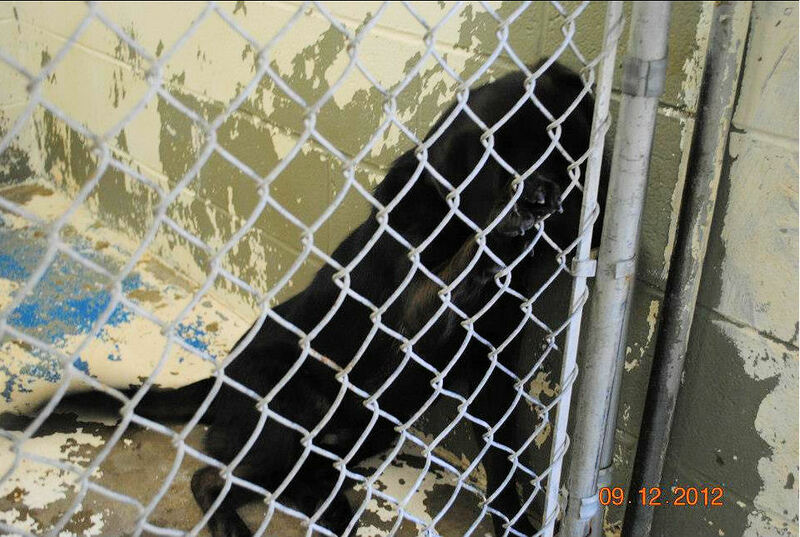 There are no notes indicating any pleas were issued to the public for fosters or any rescue groups contacted. On Sunday the 16th, MAS was closed. There are no notes in the records to indicate that any care was provided that day. No weights were recorded in their records and they did not see a vet. 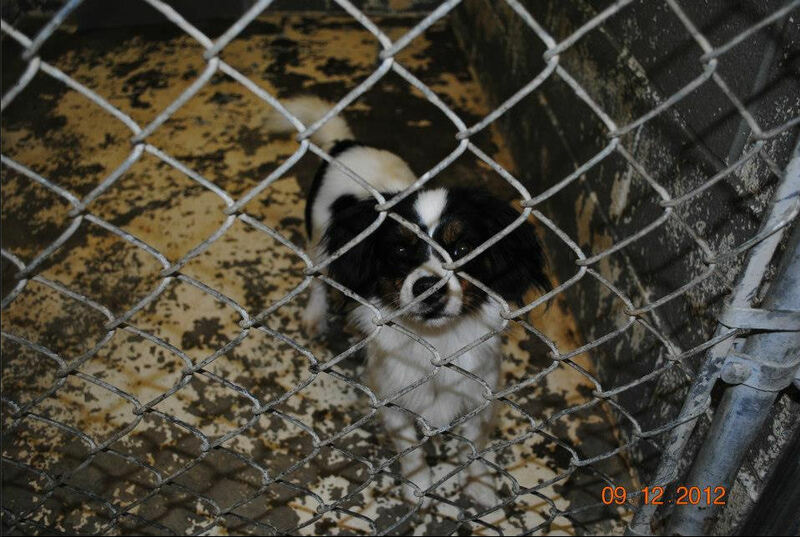 There are no notes indicating any pleas were issued to the public for fosters or any rescue groups contacted. Given that the kittens were apparently still alive on Sunday, I am assuming they had received some care, whether from a mama cat or a person, but that is not something confirmed by the records. On Monday the 17th, MAS was again closed. There are no notes in the records to indicate that any care was provided that day although again, I am operating on the assumption that they were in fact receiving some form of care given that they were still alive. No weights were recorded in their records and they did not see a vet. There are no notes indicating any pleas were issued to the public for fosters or any rescue groups contacted. A supervisor noted in the kittens’ records that they were taking up space needed for other animals (in a facility with plenty of empty cages) and their time had expired. In fact, their time had not expired and the review date listed on both kittens was September 20. Both kittens, and presumably the sibling, were killed on the 17th, violating the legally mandated holding period for strays. Since I can not verify via the records that these kittens did receive some form of care while at MAS, I want to make clear one specific point, regardless of whether it applies to these particular pets. I do not condone the killing of kittens who are not determined by a vet to be medically hopeless and suffering. But if a situation occurs where a shelter outright refuses to do its job, makes no effort to find anyone willing to provide care for newborn orphaned kittens, and does not place them with a nursing mama cat willing to accept them, I see no justification for forcing the kittens to suffer in a cage for any length of time without care. The pain from distended bladders, illness from the toxic build-up of waste, dehydration and starvation from lack of bottle feedings and chill from a lack of heat source would be excruciating for neglected orphan kittens. 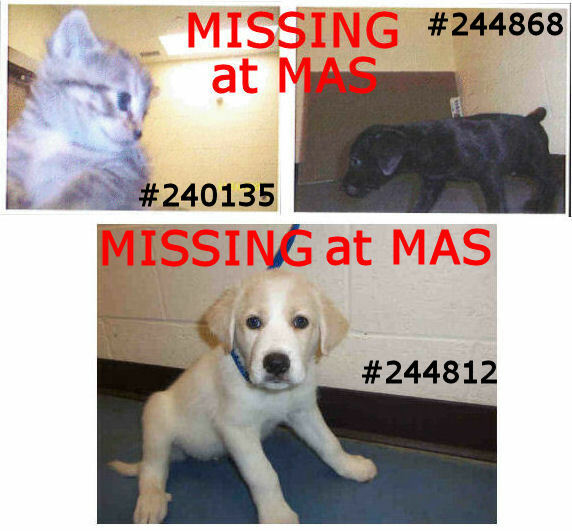 The MAS records for the two kittens pictured seem to indicate at least some degree of neglect (the severity of which is difficult to determine due to the shoddy record keeping practices at MAS) and a violation of the stray holding period law. This was the entirety of their brief lives. 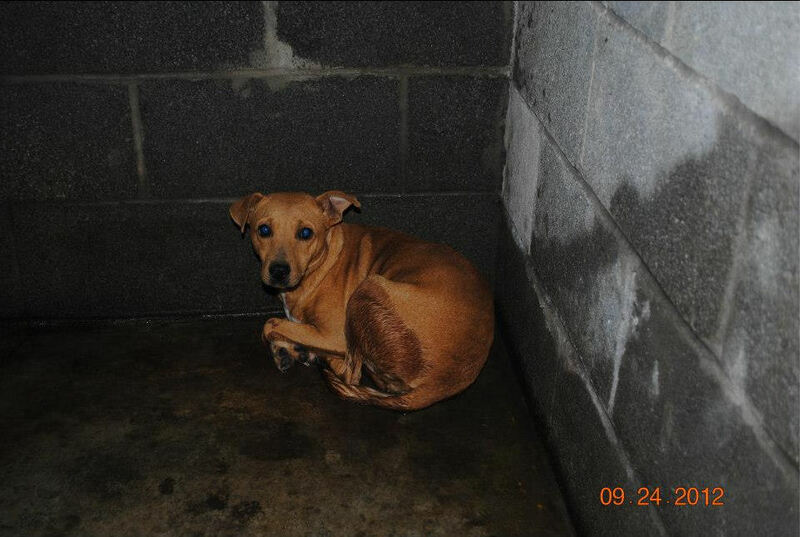 Memphis, this is your public animal shelter. These are the people you pay to care for the community’s pets in need. How many more must suffer and die within these $7 million walls? An Oregon couple took in an elderly stray Pomeranian about a year ago. The dog reportedly has lung disease, bronchitis and emphysema as well as “lumps on her belly”. They recently took her to The Willamette Humane Society and signed her over to the shelter, thinking she would most likely be euthanized. The shelter found the dog had a microchip and attempted to contact the former owners. 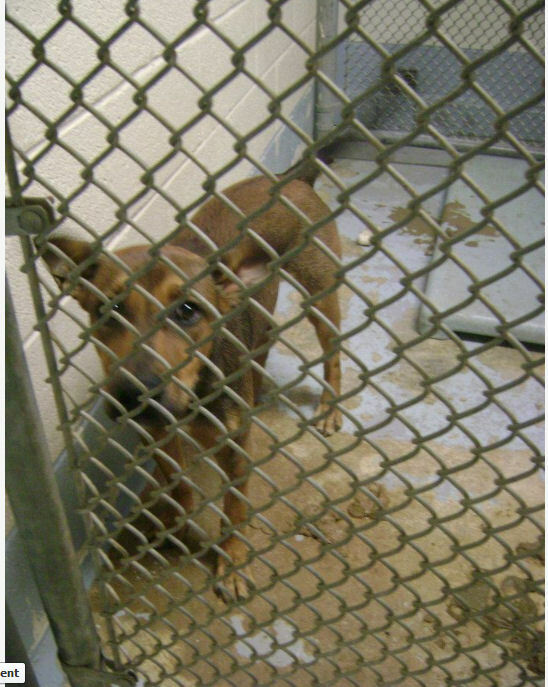 While waiting for a response, the shelter vet examined the dog and determined she was not medically hopeless and suffering and that euthanasia was not appropriate. After caring for the dog for 12 days, the shelter found hospice care for her and called the owners to advise. The owners were shocked since they had assumed their pet had been euthanized. They decided to take their dog back and make an appointment with a veterinarian to get advice on how best to care for the dog. There is a video at the link which shows the dog walking around and resting on the couch. At one point in the interview, the owner uses the dog’s name in a sentence and the dog, in the background of the shot, obviously recognizes her name and perks her ears up. She looks pretty good for an old dog although I suspect she is more than 10. What are your thoughts on this story? The shelter says they explained “the rules” – presumably that they don’t euthanize animals based solely upon owner request – when the dog was dropped off. The owners were operating on the assumption the dog was dead although they did not ask to stay with the dog during euthanasia. Did either the shelter or the owners do anything wrong? 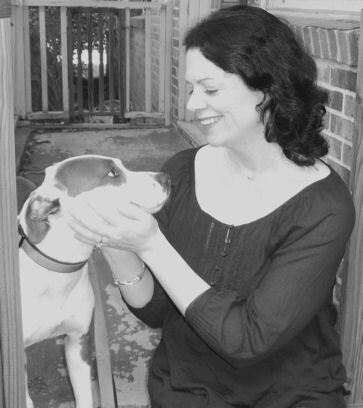 If you were the shelter director, would you have returned the dog to these owners? What do you think the future may hold for this dog? 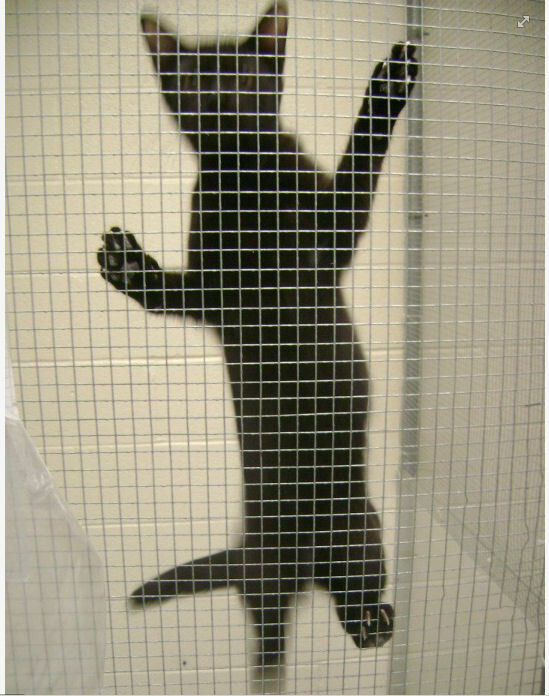 Kitten #240135 was impounded by Memphis Animal Services (MAS) on May 1, 2012. She was listed as a 1 month old female. As of September 18, there is no outcome for this kitten. The entirety of her medical records consists of a single exam on May 2 containing the note “too young”. The records clerk was asked three times (once on the initial request and twice in follow up e-mails after the records were received) for the outcome records for this pet. The records clerk confirmed there are no other records. 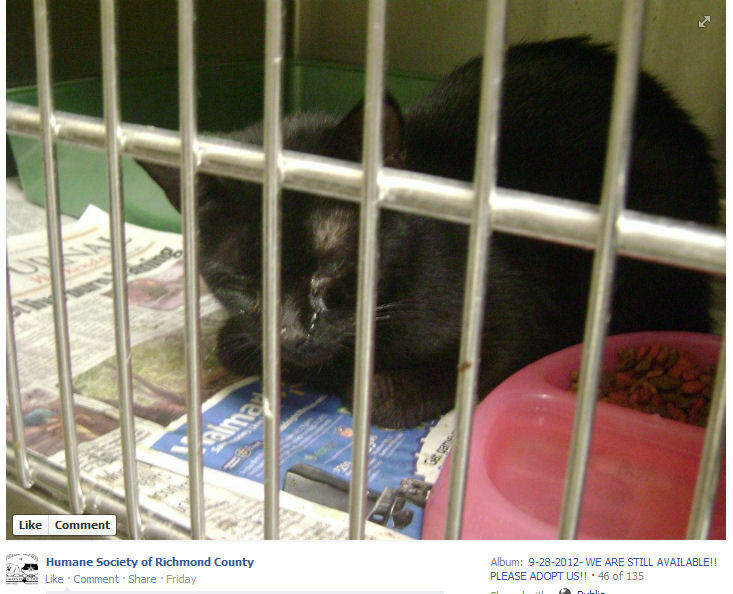 There is no record that this kitten was adopted, went to rescue or foster, died in her cage or was killed by MAS. This kitten is not in a cage at MAS to the best of my knowledge and hasn’t been there for months. Where is kitten #240135? 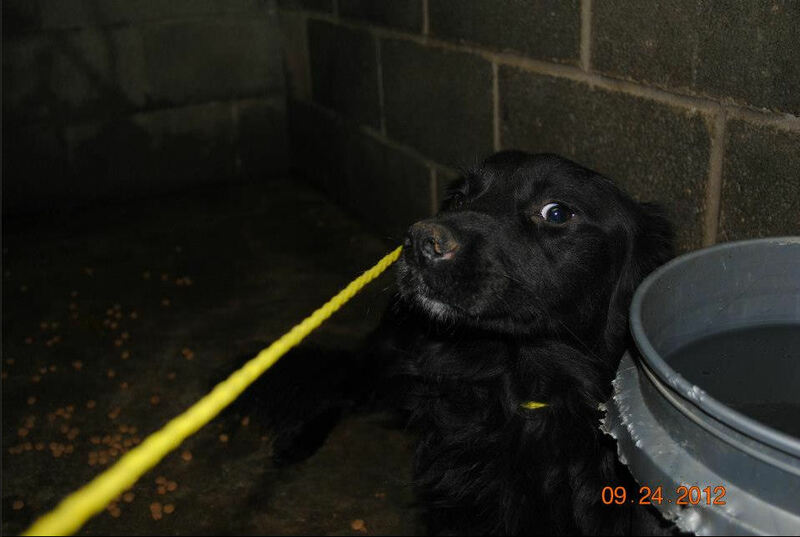 Puppy #244868 was surrendered to MAS on August 9, 2012. He was listed as a 4 week old male weighing one pound. On August 10, he was dewormed and vaccinated. I don’t know if he was ever seen again because the only other notation in this puppy’s record is on September 15 when the MAS veterinarian reported that his “location and disposition are unknown”. Where is puppy #244868? 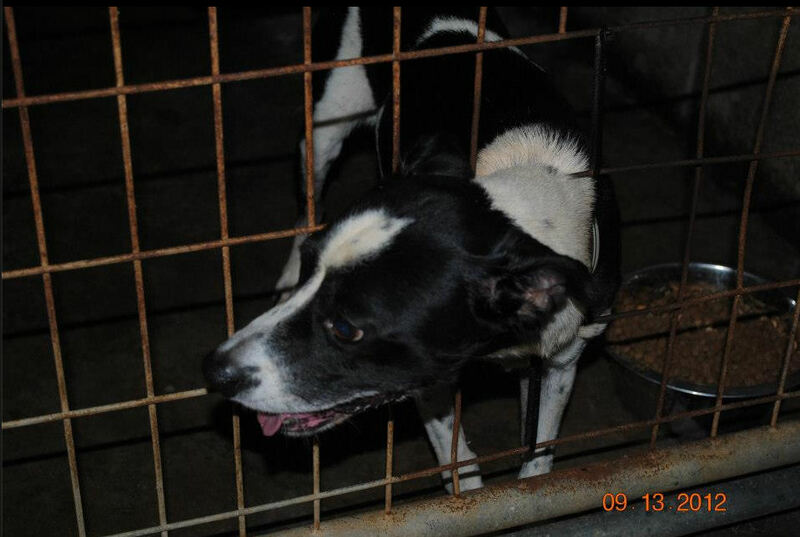 Puppy #244812 was impounded by MAS on August 8, 2012. He was vaccinated on August 9 and someone expressed an interest in adopting him on August 14. I don’t know if he was ever seen again because the only other notation in this puppy’s record is on September 15 when the MAS veterinarian reported that his “location and disposition are unknown”. Where is puppy #244812? Are these babies unaccounted for due to shoddy record keeping or is there some other explanation? What happened to these pets? Are they alive somewhere? What staff members were signing off on the daily cleaning, feeding and care for each of these pets? How does a shelter with such a notorious history of pets going “missing” continue to lose pets? When is Memphis going to clean up its act and get rid of everyone there who participates in and enables this unacceptable state of affairs? Fire. Them. All. The two employees at the McCracken Co Humane Society in KY who were charged in connection with improper pet killing and falsifying records have had their day in court. Anderson will remain on probation for 2 years and can no longer have a job where he is around animals. She received a 60-day sentence at the county jail and a $250 fine. He also criticized the prosecution’s case saying Hall had been charged with improper euthanization of cats but a certified animal control agency or even a cat had not been defined. A cat, he said, is a feline older than three months but the prosecution had not proved all animals involved met that definition. We’re talking about someone who has worked at this shelter for 23 years and who was killing pets unlawfully according to a jury. But she hasn’t served a day in jail and in fact still holds a job sheltering animals because her lawyer wants to argue about the definition of a cat. Shame on the McCracken Co Humane Society for continuing to employ someone convicted of improperly killing pets. For the second time this month, I addressed the Kershaw Co council during the public comments portion of its meeting. I was limited to 5 minutes so I had to keep my remarks brief. I share them here in hopes that someone else may find them useful in developing a plan to address his/her own county (or city) council regarding the local shelter. Anyone is free to copy and modify these remarks. My name is Shirley Thistlethwaite and I have lived in Kershaw Co for 11 years. At the last council meeting, I spoke about no kill animal sheltering. Tonight I’d like to specifically focus on the economic benefits of no kill. I know the budget is a serious concern for everyone here. Publicly funded no kill open admission shelters are succeeding in more than 50 communities in the U.S. When they stopped killing healthy/treatable pets, they started saving more than lives – they saved money. I’d like to see Kershaw Co move in this ethically and fiscally responsible direction too. The estimated cost to impound and kill a pet is $106. This includes labor, feeding, housing, controlled substances and associated killing supplies as well as disposal. This is entirely budget negative. 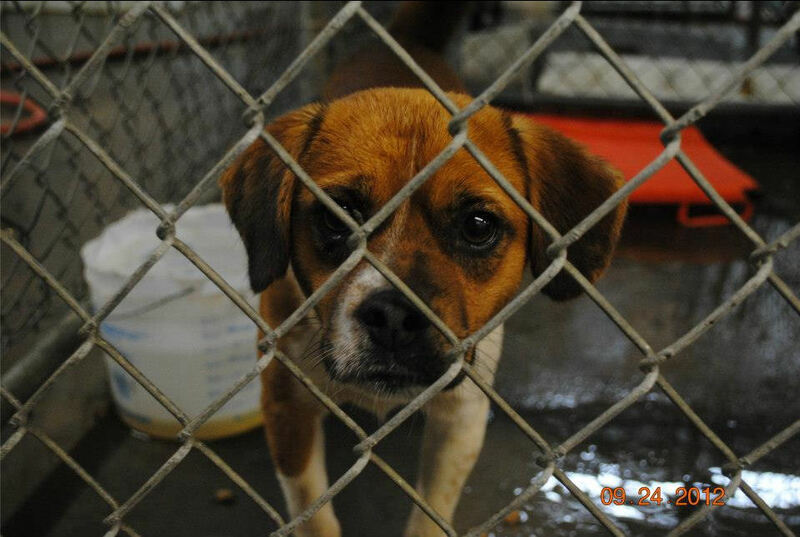 In 2011, Kershaw Co killed 3147 pets. We can do better. In contrast, open admission no kill shelters save municipalities the costs associated with large scale pet killing and transfer some of the costs associated with lifesaving to private charitable groups willing to partner with a shelter that does not kill pets. Open admission no kill shelters also bring in adoption fees. Imagine if Kershaw Co had collected adoption fees on most of those 3147 pets last year instead of spending taxpayer money to put them into the dumpster. And perhaps most importantly, open admission no kill shelters put neutered pets into the community, resulting in lower pet birth rates which ultimately reduces municipal animal control costs. 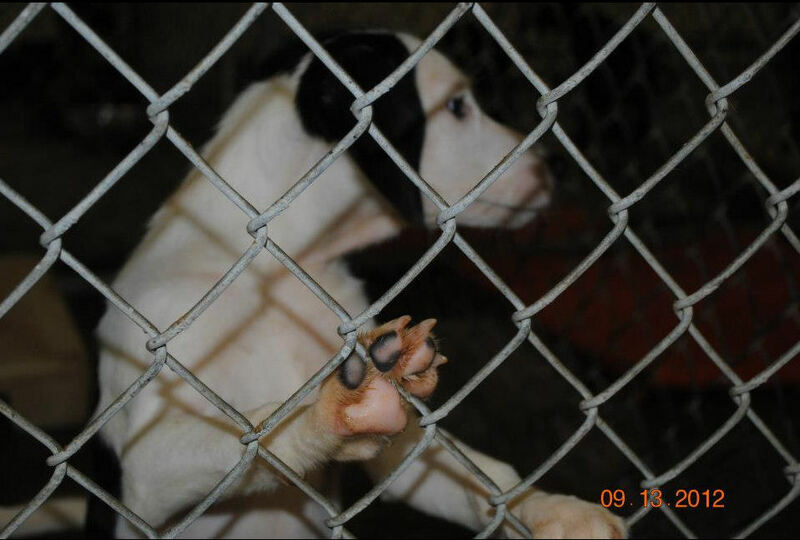 We know people here in Kershaw Co love pets and are going to get them. But many won’t consider going to a pet killing facility to adopt and seek alternative sources for their animals. Why not transform the shelter into a pet saving facility, encouraging people to visit and adopt so we can get neutered pets into homes? It only makes sense. In 2011, the shelter took in 70 pets per 1000 county residents. This is 5 times the national average. We are taking in too many pets and killing 73% of them. We can do better. By investing in programs aimed at reducing the number of pets coming into the shelter, we can expect economic benefits. These programs include assistance for owners who are facing challenges they do not know how to meet with their pets before they surrender them to the shelter. Examples of these would be pet food banks, behavior counseling, and self-rehoming assistance. Proactive redemptions – returning pets to their homes before taking them to the shelter – has proven key in many communities to reducing intake. Low and no cost spay-neuter programs and Trap-Neuter-Return (TNR) provide numerous benefits, one of which is reducing intake in both the short and long term. As long as the shelter currently has sufficient staff, it is unlikely that an increase in staff would be needed in order to stop killing pets. And it’s likely that more volunteers would be willing to help at the shelter if it stopped the killing. I would be one of them. Former donors who currently send their contributions elsewhere because of the fact that Kershaw Co kills roughly 3 out of 4 of its pets would be welcomed back. Likewise, there are numerous private rescue groups willing to partner with no kill shelters and to take on the costs of care by pulling pets out of the shelter. 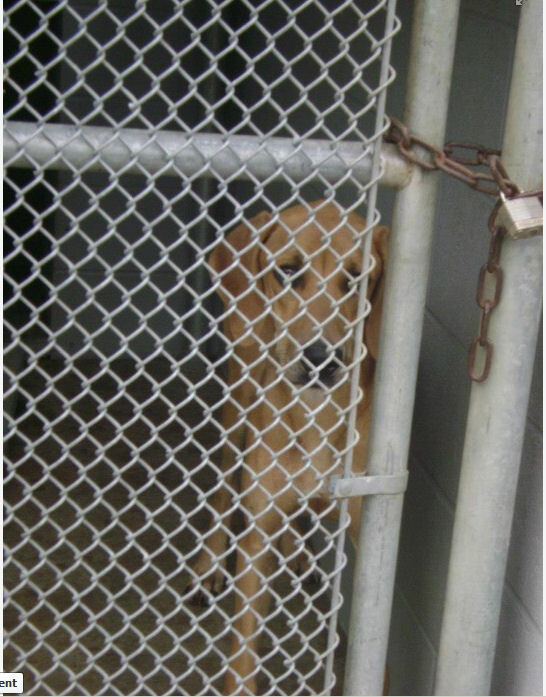 By partnering with the community, redirecting the efforts of the staff toward lifesaving, utilizing free labor in the form of volunteers, and opening the door to private donors and rescuers who want to support true sheltering of Kershaw Co’s community pets, the county need not worry that no kill would require an outlandish level of funding. We can do better with our taxpayer dollars and we can do it today. How much longer can we afford to wait? Thank you for the opportunity to address the council and please let me know if I can provide any additional information about no kill sheltering. I left copies of Dollars and Sense from the No Kill Advocacy Center for the council members after I finished speaking. The last few posts on the blog have involved pets being needlessly and “accidentally” killed by the municipal shelters charged with protecting them. 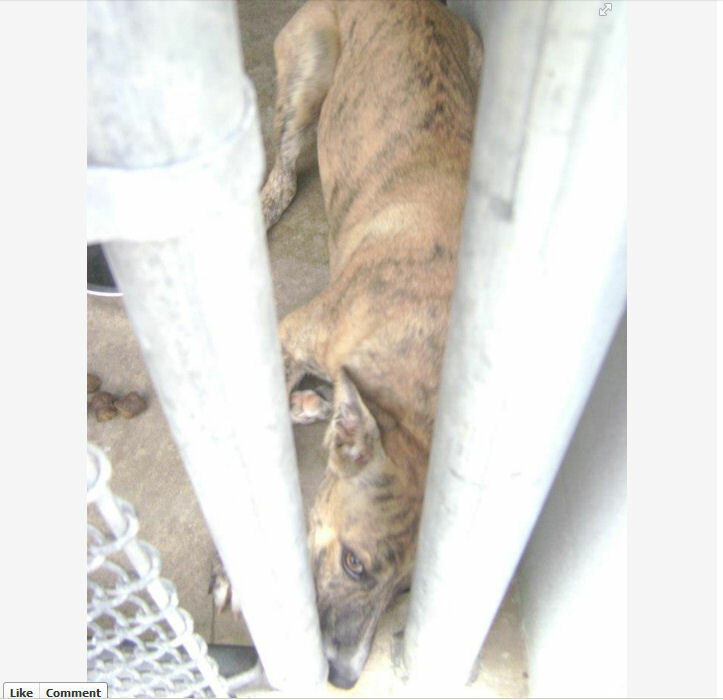 In Hernando Co, the victim was a dog whose owner, if he had one, wasn’t given the legally mandated time to redeem him because the pound oops-killed him before the holding period expired. In Jacksonville, it was two newborn kittens who were being transferred from one foster owner to another when the pound oops-killed them without bothering to check. And in Yuma, AZ, a lost dog whose owners tried to redeem him but were turned away by the pound was oops-killed for coughing. When public shelters fail to do their jobs and cultivate a culture of killing healthy/treatable pets as the acceptable norm, they damage more than just the staff, volunteers and rescuers involved in day to day operations. They pollute the community with this morally bankrupt ethos. A young man in MA had flea bath appointments for his two cats at a veterinary clinic last week. He first dropped off one kitty, signed the form he was given, then returned shortly afterward to deliver the second cat. As he was signing that form, which he assumed was a basic form allowing the cats to have flea baths, the vet asked him if he wanted to keep the bodies. As it turns out, the form the young man was given was an authorization to euthanize a pet, not a consent for a flea bath. No one at the clinic reportedly explained anything to him – just got his signature on the form and took the cat. The vet who killed the first cat and was prepared to kill the second one declined to speak with the local TV news but instead hid behind his lawyer, who also hid. The practice of killing healthy/treatable pets without asking questions, commonplace in too many municipal shelters, is accompanied by a lack of compassion and a failure to stand up for a pet’s most basic right: the right to live. This disturbing attitude is not limited to animal shelters and creeps into society at large. But shelters, whose very names imply a duty to act as a safe haven, provide humane care and protect pets from cruelty, are community leaders and must set the example for others to follow. When shelters, humane societies and societies for the prevention of cruelty kill healthy/treatable pets without question and do not advocate for the right of pets to live, it is not surprising to find individuals in the community adopting this same attitude. It also doesn’t surprise me to read that, when confronted about the killing of a healthy pet, the vet refused to stand behind his actions. Again, a page from the playbook of too many pounds in this country. 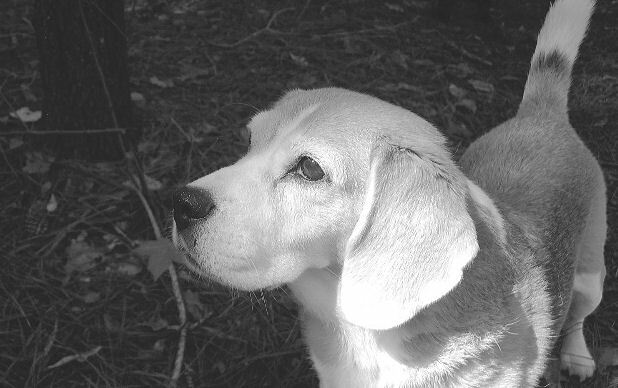 Everyone knows killing healthy/treatable pets is wrong – even those doing the killing. But most of them aren’t going to stop on their own. It is up to us as pet lovers and ethically responsible people to publicly demand an end to the killing of healthy/treatable pets and to demand their right to live be respected. Until we change the culture of acceptance concerning needless pet killing, we will continue to witness this unending parade of death. And in the end, it doesn’t matter much whether the pets at the landfill were killed by “accident” or by design. What matters is that most people accept the killing as “necessary” and some even go so far as to call it a “kindness”. This must change.